Hair: Dark brown, cropped short yet feministic, no adornments Blood red, mid length, typically pulled back into a high pony-tail. 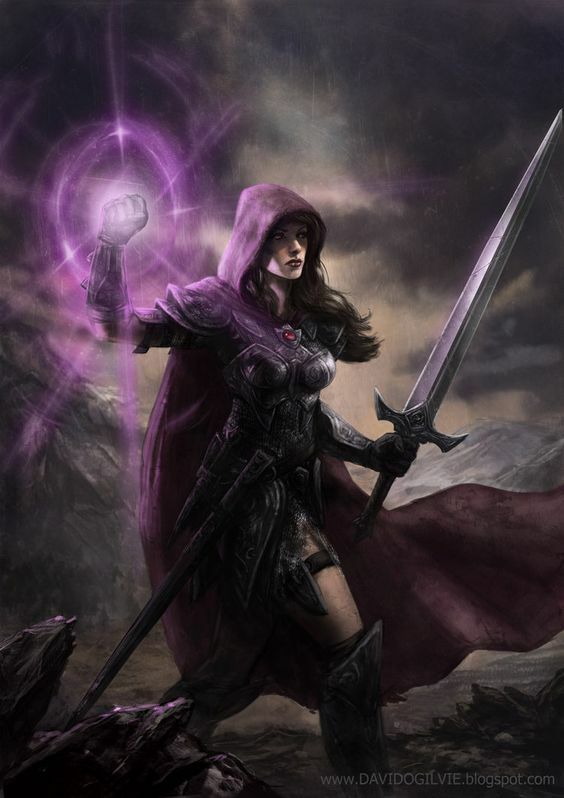 Mirannda is typically seen wearing mostly leather armors, black boots and a purplish-black cloak which helps conceal her face in shadows. When not in this, she prefers black, teal or purple clothing. Personality: Mirannda is at a critical point in her life where she is constantly changing. Once a quiet and patient woman by nature with a strong sense of justice, a kind and gentle woman who helped those in need. Then she tried to be out for herself, do as she pleased, when she pleased, damn the consequences. Even in the face of fear and danger, Mirannda still tries hard to hide it behind a mask of confidence. No matter what she finds herself doing, Jaliza's sense of survival will dictate her decisions and actions. Leaving their faces forever grim. Due to health reasons, her parents abandoned her shortly after hatching, binding her form to that of an elf. She was raised as an elf in servitude, secretly learning magic from a friend. When her mistress accused Jaliza of stealing, Jaliza ran to save her life. For years, she traveled and learned critical survival skills and became a mercenary, defending the weak and protecting the poor. At the vampire's bidding, Jaliza created a disguise and joined Elysium Order. She must revert back to her selfless days to blend in with the guild's objectives, and ensure her cover is not blown without any indication as to why she is planted there as what she can only assume is to spy. It has become a chore to balance her task and her personal pleasures, as of how she must act as Arlyn was a grueling task. For some time, this had gone on until a solar eclipse shadowed the land. It had a harsh effect on Jaliza, yet allowed her to learn the truth as to why she was abandoned. A few days into her recovery from the eclipse, a storm came and swallowed her up, leaving her in an unknown land, without even her faithful cousin phoenix she had named Elata Etney. A pretty gemstone that is either purple or blue. A majestic bird, the phoenix is said to burst into flames when it dies, and is then reborn from the ashes. A fiercely loyal companion. When consumed, this unique brew temporarily increased the users resistance against the element of fire. A higher level of lightning tonic, the Raiju Elixir temporarily provides imbibers with superb protection against the element of lightning. Fire sprite that can shapeshift and set things on fire. Raleaz was once a powerful necromancer from Mamlak, of great renown. In the middle of a ritual, however, something went horribly awry, and he was consumed by the very arts he practiced, leaving only his skull behind. It is widely believed that this artifact strengthens dark and unholy magick. The blade of this dagger is quite keen, though no blood spills when it cuts flesh. Instead, the person injured falls into a deep sleep for several minutes depending on their will. A higher level of darkness tonic, the Demon Elixir temporarily provides imbibers with superb protection against the element of darkness.